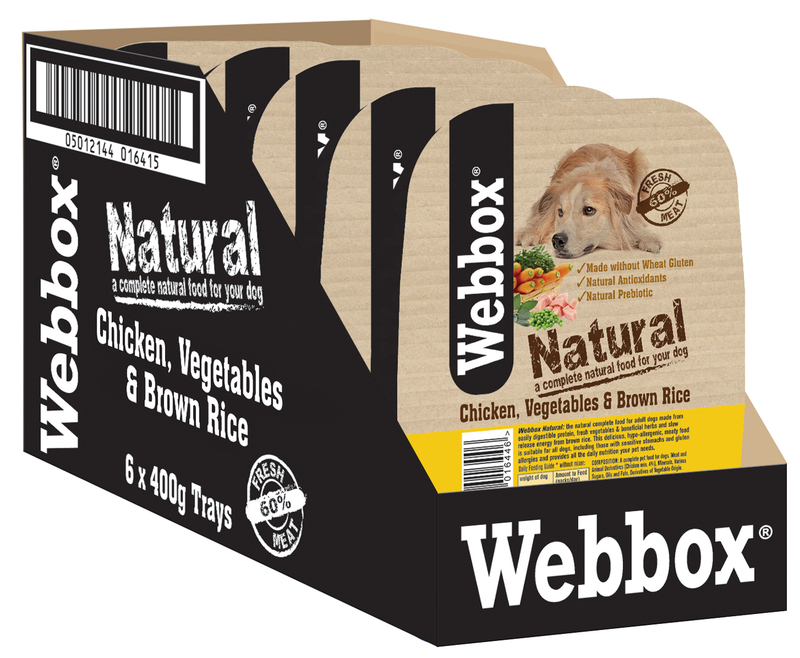 The Natural range from Webbox is a complete, moist food which contains only natural ingredients and no wheat gluten. Each tray contains a massive 60% of fresh meat, along with fresh vegetables and brown rice, to produce a tasty meal that your dog is sure to enjoy. With natural antioxidants and a prebiotic, the Webbox Natural range is suitable for dogs with food allergies and those with sensitive stomachs. Chicken (60%), Carrots (4%), Peas (4% from Dehydrated), Brown Rice (4%), Seaweed, Chicory (0.2%), Sage (0.1%), Antioxidants: Natural Antioxidants from Mixed D-Tocopherols. Lamb (30%), Chicken (30%), Carrots (4%), Peas (4% from Dehydrated), Brown Rice (4%), Seaweed, Chicory (0.2%), Rosemary (0.1%), Antioxidants: Natural Antioxidants from Mixed D-Tocopherols. The quantities shown should be used as a guide only. Every dog's appetite is different depending upon size, age, condition and level of activity.Fresh water should be provided at all times. There are currently no questions for Webbox Natural Complete Dog Food - be the first to ask one!